Gibraltar is a small location in Andalusia where you can have the feeling of visiting England. 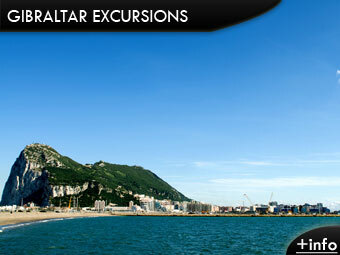 In Gibraltar we can enjoy a day of shopping, dolphins, Gibraltar city or the rock tunnels. There are many things to enjoy in this city, do not hesitate to come and spend a day in Gibraltar. Getting to Gibraltar from Malaga is easy if we have our own car, in about 1 ½ hours, we recommend hire a car at Malaga airport if you have a driver's license. The price of the excursion to Gibraltar ranges between 18 € and 45 €, depending on the excursion we choose; the duration is one day, with regular departures from Monday to Saturday throughout the year except bank holidays. Each tour includes everything you need depending on the chosen trip to fully enjoy the visit and experience. If you plan to go during the winter do not forget to bring warm clothing as it is very cold in Gibraltar. Where can I book an excursion or tour to Gibraltar? Malaga to Gibraltar: Here you will find information on how to get to Gibraltar from Malaga and the different options. Transfer Malaga airport to Gibraltar: For you, your family or a group of people. Check prices and different options from Malaga airport.